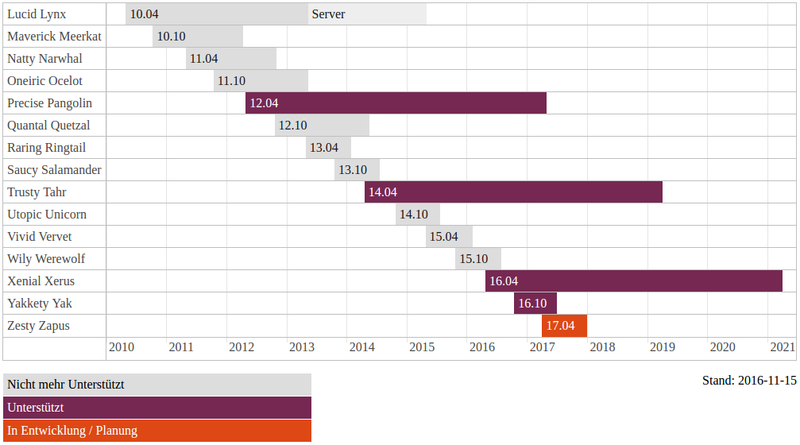 If you use Ubuntu on your Systems, you perhaps read last weeks about a new Release Version. I am often asked, must i upgrade now? My answere at first is not really, cause the new Versions are not cleaned up by all bugs and the User or Admin must recheck against the new advantages of the new Releases for production usage. I prefer to wait 3 Month after a Release by Ubuntu is published. But if you setup a very new Hardware your are often forced to take the LAST Release Version, cause it supports newest Hardware Chips by the latest Kernel (for example Laptop mixed Chips Wifi/Bluetooth/USB3.0). Remark: You should read the “release notes” of the Versions, cause this can prevent you from running into trouble or “black screens”. DONT forget to Backup the old OS if you try to start the Upgrade. Fresh Setup’s are often smaller and more free of Bugs as “upgraded Systems”! Cause sometimes the old Configs are not all updated or replaced! (User-Homes). New Releases can allocate MORE Disk Space and offer new Call Home Sniffing Tools, RECHECK open Ports, running Processes and Privacy Settings! On Companies you must always setup a “Lab PC” for Testing the new Releases before rolling out the OS. Print this Release Timeline out to be updated daily..